Crown fractures represent the largest part of traumatic injuries to the permanent teeth. They are relatively common event among schoolchildren. They create serious functional, esthetic and psychological problems for both children and their parents. The front position of fractured teeth gives precondition for easy notises which make esthetics the most important factor. The clinicians should deal well with all characteristics of color, shape and adhesive protocol. Difficulties may occur because of the small patient’s age, the right choice of treatment plan and its fulfillment. In this review are collected data for the method composite resin build-up when restoring fractured incisors. A different improvements and objections have been discussed in order to achieve succession in the right therapeutic approach. Key words: composite resin, crown fractures, permanent teeth. 1. Alonso de la Pena V, Balboa CO. Direct composite coronal restoration of two fractured incisors: an 8-year follow-up. Dent Traumatol 2005; 21: 301-305. 2. Andreasen J, Ravn J. Epidemiology of traumatic dental injuries to primary and permanent teeth in a Danish population sample. International Journal of Oral Surgery 1972; 1: 235-239. 3. Bichacho N. Direct composite resin restorations of the anterior single tooth: clinical implications and practical applications. Compend Contin Educ Dent. 1996; 17: 796-802. 4. Brambilla GP, Cavallи E. Fractured incisors: a judicious restorative approach—part 3. Int Dent J. 2007 Jun;57(3):195-204. 5. Bryan RA, Welbury RR. Treatment of aesthetic problems in pediatric dentistry. Dent Update 2003; 30: 307-313. 6. Davis N. A nanotechnology composite. Compend Contin Educ Dent 2003; 24: 662, 665-667, 669-670. 9. Lambert DL. Conservative aesthetic solutions for the adolescent and young adult utilizing composite resins.Dent Clin North Am. 2006 Jan;50(1):87-118. 10. Milnar FJ. 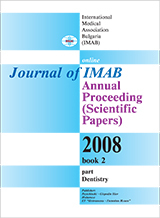 Selecting nanotechno­logy-based composites using colorimetric and visual analysis for the restoration of anterior dentition: a case report. Dent Today 2004; 23: 98-103. 11. Panduric V, Gabric D, Negovetic-Mandic V. Dent Traumatol. Immediate post-traumatic upper incisor reconstruc­tion using composite resin materials. 2008 Feb;24(1):108-11. 12. Ragain JC, Johnson WM. Accuracy of Kubelka-Munk reflectance theory applied to human enamel. J Dent Res 2001; 80:449-452. 13. Rauschenberger CR, Hovland EJ. Clinical management of crown fractures. Dent Clin North Am1995; 39: 25-51. 14. Robertson A, Robertson S, Norйn JG. A retrospective evaluation of traumatized permanent teeth. Int J Pediatric Dent 1997; 7: 217-26. 15. Sakai VT, et al.Predictable esthetic treatment of fractured anterior teeth: a clinical report. Dent Traumatol. 2007 Dec;23(6):371-5. 16. Sandesh M. Shades of color. Illusion or reality? Dent Clin North Am 2001; 45:155-180. 17. Sensi LG, Webley W. A simplified approach for layering composite resin restorations Gen Dent.2007 Nov; 55(7): 638-45. 18. Spinas E. Longevity of composite restorations of traumatically injured teeth. Am J Dent. 2004 Dec;17(6):407-11. 19. Strassler HE. Aesthetic mana­gement of traumatized anterior teeth. Dent Clin North Am1995; 39: 181-204. 20. Tan DE, Tjan AHL. Margin designs and fracture resistance of incisal resin composite restorations. Am J Dent 1992; 5:15-18. 21. Ten Boch JJ, Coops JC. Tooth color reflectance as related to light scattering and enamel hardness. J Denr Res 1995:74:374-380. 22. Terry DA. Enhanced resilience and esthetics in a Class IV restoration. Compend Contin Educ Dent Suppl 2000; 26: 19-25. 23. Terry DA. Utilization of a small- particle composite resin for anterior and posterior restorations. Pract Periodontics Aesthet Dent 2000; 12: 371-378. 25. Zalkind M, Heling I. Composite resin layering: an esthetic technique for restoring fractured anterior teeth. J Prosthet Dent 1992; 68: 204-205. 26. Zaragosa AA, Catala M, Colmena ML, Valdemoro C. Dental trauma in schoolchildren six to twelve years of age. ASDC J Dent Child. 1998; 65: 492-494.